Someday I'll Sleep Autism Blogs: Guess the Baby's Stats! A Baby Pool! We're in the home stretch (how many times have I typed that now? Every. Single. Day?) and I thought it would be fun to set up a baby pool for anyone who wants to guess the baby's stats before he arrives! But before you do I thought I'd give you a few hints on baby's size, based on some of our last baby's information. First, the stats for the last three. Sadie was born at 40 weeks and was 22 inches and 9 lbs 4 oz. Maggie was born at 39 weeks and was 21 inches 9 lbs 1 oz. Patch was born at 39 and a half weeks and was 22 inches and 8 lbs 12 oz. The new baby won't make it to his due date on the 18th. His c-section is scheduled for the 13th at noon... however no one knows if he'll make it quite that long! Here are a few other facts that may or may not help. With all the other babies my waist reached a certain measurement and stopped. This baby had already exceeded that by four inches last week, which is why in this latest picture it looks like I have a basketball stuffed under my shirt. I'm not sure if that actually means he's big, but it certainly feels that way to me! 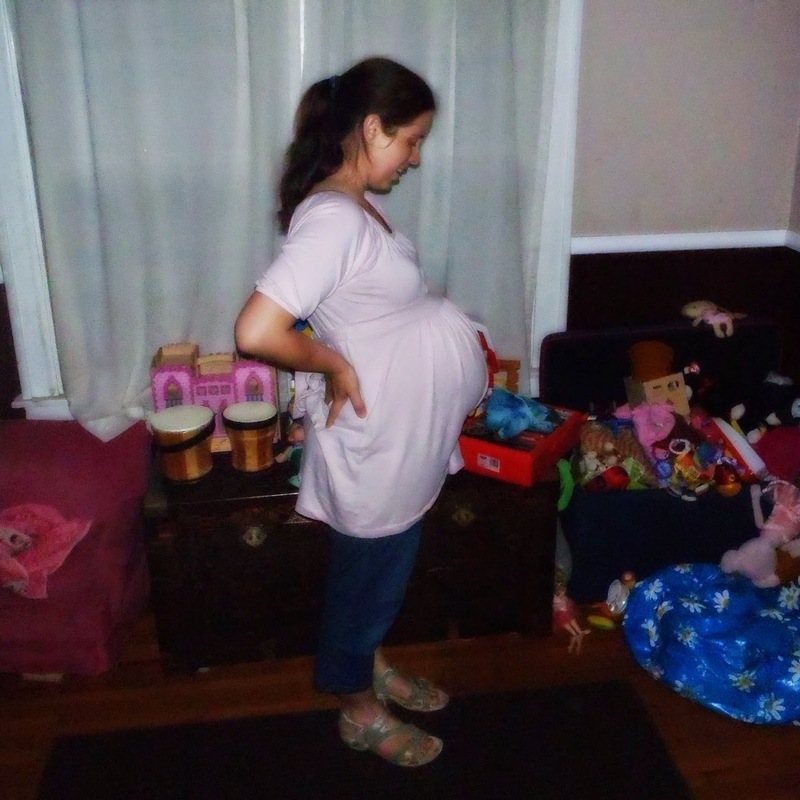 As a somewhat miraculous side note... those are non-maternity pants that some how still button. In my general gigantic-ness of the moment I'm kind of clinging to that fact. Other than that the general consensus seems to be that this baby is on the large side, although he is still small enough to flip from breech to transverse on a daily basis (a half dozen times if he feels like it). So there you have it! A place to guess if you feel so inclined! Hmmm… tough, but I’d say October 13th, 22 inches, 9 lbs., 6 oz.